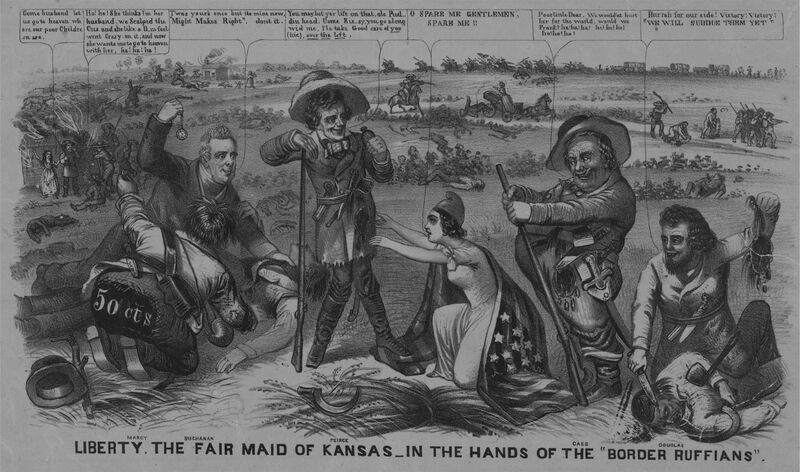 On March 30, 1855, "Border Ruffians" from the pro-slavery state of Missouri illegally voted in the free territory of Kansas, electing a pro-slavery government. This political cartoon, attacking the Democratic Party and "Bleeding Kansas," appeared during the presidential campaign of 1856. In the center stands Democratic President Franklin Pierce, dressed as a "Border Ruffian," as the violent, pro-slavery invaders of the Kansas territory from Missouri were known. The allegorical figure of Liberty kneels at his feet. Further to the right are Democratic presidential candidates Lewis Cass and Stephen Douglas. On the left are Pierce's Secretary of State William Marcy and presidential candidate (and eventual winner) James Buchanan. Border Ruffians crossed the border, took control of polling places, prevented anti-slavery residents from casting votes, and stuffed ballot boxes. This was all illegal, but a pro-slavery government was elected. The elections did not end the conflict. In fact, Kansas became the single most important region for the slavery debate throughout the 1850s. It was also the most violent. The brutal series of conflicts in Bleeding Kansas continued until Kansas joined the U.S. as a free state in 1861—the year the Civil War began. technology (such as a slip of paper or an electronic form) by which a voter casts their vote. person who migrates and establishes a residence in a largely unpopulated area.